Listen to "Super Brain: Unleashing the Explosive Power of Your Mind to Maximize Health, Happiness, and Spiritual Well-Being" on your iOS and Android device. 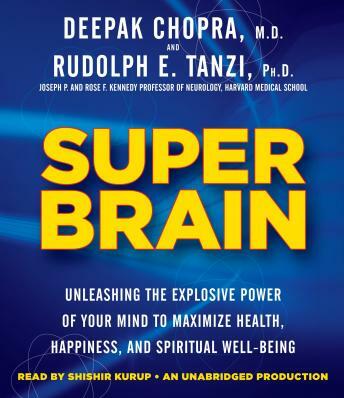 Deepak Chopra, M.D., Rudolph E. Tanzi, PH.D.
A manual for relating to the brain in a revolutionary new way, Super Brain shows you how to use your brain as a gateway for achieving health, happiness, and spiritual growth. Two pioneers, bestselling author and physician Deepak Chopra and Harvard Medical School professor Rudolph E. Tanzi, one of the world's foremost experts on the causes of Alzheimer’s, have merged their wisdom and expertise for a bold new understanding of the “three-pound universe” and its untapped potential. In contrast to the “baseline brain” that fulfills the tasks of everyday life, Chopra and Tanzi propose that, through a person’s increased self-awareness and conscious intention, the brain can be taught to reach far beyond its present limitations. “We are living in a golden age for brain research, but is this a golden age for your brain?” they ask. Your brain is capable of incredible healing and constant reshaping. Through a new relationship with your brain you can transform your life. In Super Brain, Chopra and Tanzi guide you on a fascinating journey that envisions a leap in human evolution. The brain is not just the greatest gift that Nature has given us. It’s the gateway to an unlimited future that you can begin to live today. As fanciful as The Secret and others of the same type. I\'m disappointed! amazing to say the least! had a brain injury helped me immensely!! love Deepak, have read most of his books and seen him in person. have heard book twice now and learn new stuff ...this is a keeper!